Perhaps the most intimidating part of having a baby in the NICU is all of the unfamiliar equipment and procedures in the neonatal intensive care unit. Seeing your baby hooked up to machines and covered with wires can be scary, but the equipment is all there to help your baby get well. NICU equipment can serve many different purposes from monitoring your preemie's health and vitals to supporting their breathing. One of the most frequently asked about devices is the ECMO, so before we look at other NICU equipment and procedures, let's first look at ECMO. ECMO is an abbreviation that stands for extracorporeal membrane oxygenation. An ECMO machine is a machine that takes blood from the body, oxygenates it using an artificial lung and pumps it back into the body using an artificial heart. ECMO is similar to a heart/lung bypass machine used in open heart surgery but can be used for a longer time. More specifically, ECMO infuses the blood with oxygen and removes carbon dioxide, a waste product of respiration. Additionally, ECMO can provide blood pressure support. Whereas full cardiopulmonary support machines or "heart-lung" machines can be used only for a few hours in the operating room, ECMO can be used for longer in settings outside of the operating room like the NICU. ECMO may also be used for any serious condition that causes a baby's heart or lungs to stop working well. Because ECMO can be used only for up to a few weeks, it is used only for patients who are expected to recover after treatment or surgery. To start ECMO treatment, physicians will place long tubes called catheters into a baby's blood vessels. The catheters may go in through a small incision in the baby's neck or groin and will travel to the large vessels near the baby's heart. Once the catheters are in place, physicians will hook them up to the ECMO machine tubing, which will already be filled with donor blood. When the ECMO machine is turned on, it will drain blood from the baby, pump it through a membrane that adds oxygen and removes carbon dioxide and return the oxygenated blood to the baby. Bleeding: Heparin, a blood thinner, is used to prevent blood clots during ECMO treatment. Heparin may cause bleeding from where the tubes are inserted or in other parts of the body. Infection: Any time a foreign object, such as an ECMO catheter, is put into the body, it can cause infection. Intraventricular hemorrhage (IVH): Bleeding into the brain is a serious complication of ECMO treatment. Blood clots: Small blood clots may form in the ECMO tubing. These clots may travel through the bloodstream and cause injury or even death. Blood transfusions: Frequent blood transfusions may be needed when a baby is on ECMO. Although the blood supply is very safe, there is always a risk of disease from donor blood. Nasal cannulas: A nasal cannula is a set of small nasal prongs may provide a higher concentration of oxygen than room air. They may also deliver room air at a higher flow, which helps to keep airways open and encourage babies to breathe on their own. CPAP: Continuous positive airway pressure, or CPAP, is a mask or a special set of nasal prongs placed firmly on baby's nose to constantly blow air. The constant pressure encourages open airways and reminds babies to breathe, and higher concentrations of oxygen may be used. Ventilators: If a baby is put on a ventilator, then a procedure called intubation will be used to place a special tube called an endotracheal tube in the airway through the mouth or nose. The ventilator, or respirator, is the machine that delivers breaths to babies who cannot breathe on their own or who don't breathe well. Cardiac monitors: These use stickers on the chest connected to wires (called leads) that hook up to a monitor to make sure that baby's heart is beating at the correct speed and with the correct rhythm. Respiratory monitors: Often part of the cardiac monitors, these use leads to monitor baby's breathing rate and pattern. Pulse oximeters: These wrap around your baby's wrist or foot and have a red light that monitors the amount of oxygen in the blood. Peripheral IVs: These are the "regular" IVs that go into a vein for medications or fluids. Peripheral IVs may be in the feet, hands, arms, or scalps of premature babies. Although scalp IVs look scary to parents, they are very common in the NICU since premature babies don't always have good veins for IVs in their hands and feet. PICC lines: Percutaneously inserted central catheters, or PICC lines for short, look like regular IVs. They have longer catheters, or tubes, than regular IVs, and travel through the vein into the large veins that empty into the heart. Insertion of these lines is one of the procedures NICU babies commonly undergo. Umbilical catheters: These are inserted into the umbilical cord stump and travel to the large veins and arteries near the heart. Umbilical lines may be inserted into an artery in the umbilical cord, a vein in the umbilical cord, or both, to allow fluid and medication administration, blood pressure monitoring, painless blood sampling, and other procedures. While in the NICU, your baby may require additional equipment as well. Feeding tubes: A feeding tube travels from the mouth (orogastric- called OG) or from the nose (nasogastric- called NG) to the stomach. Infants who are too sick or weak to eat from the breast or from a bottle receive food through these tubes. Inserting the tubes and giving feedings through them are common procedures among premature babies. Incubators: Premature infants have trouble keeping themselves warm, so incubators are used to provide a warm place for baby to rest. Skin probes constantly measure the baby's temperature, so he or she doesn't get too warm or too cold. Phototherapy: Preemies are more likely to have problems from jaundice. Phototherapy lights, also called bili lights, are special lights that help the baby's body break down bilirubin, the chemical that causes jaundice. American Academy of Pediatrics. "Levels of Neonatal Care" Pediatrics 2004 114:1341-1347. http://pediatrics.aappublications.org/content/114/5/1341.full. Children's Hospital of Pittsburgh. "Procedures and Equipment in NICU." Children's Hospital West. "Our Caring NICU Staff." 2008. https://www.mhs.net/locations/memorial-west/neonatal/staff. Cincinnati Children's. "Surgical Options: Extracorporeal Membrane Oxygenation (ECMO). https://www.cincinnatichildrens.org/health/e/ecmo. March of Dimes. 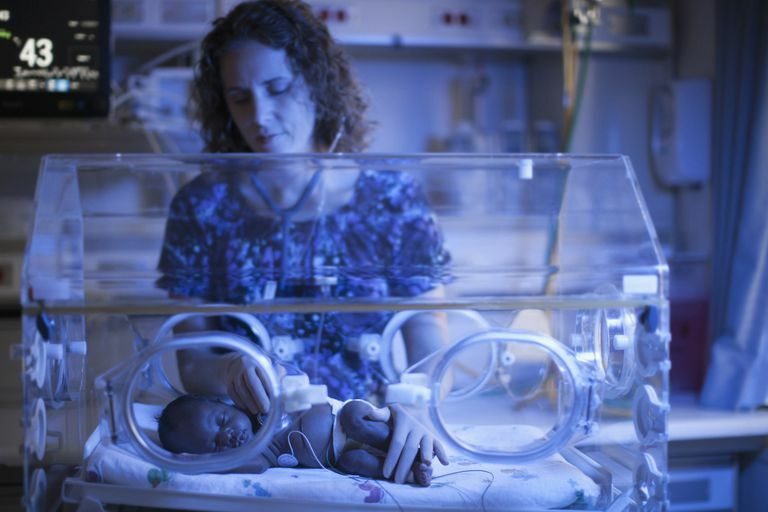 "Glossary: Common NICU Equipment." October 2008. Nemours Foundation. "When Your Baby's In the NICU." Stanford School of Medicine Lane Medical Library. "Introduction to ECMO for Parents" http://lane.stanford.edu/portals/cvicu/HCP_CV_Tab_1/ecmo_for_parents.pdf.